This month we have two beauties covering two magazine covers and clearly one being a total aesthetic, vintage one while the other going all 'Prep'd For Summer'! 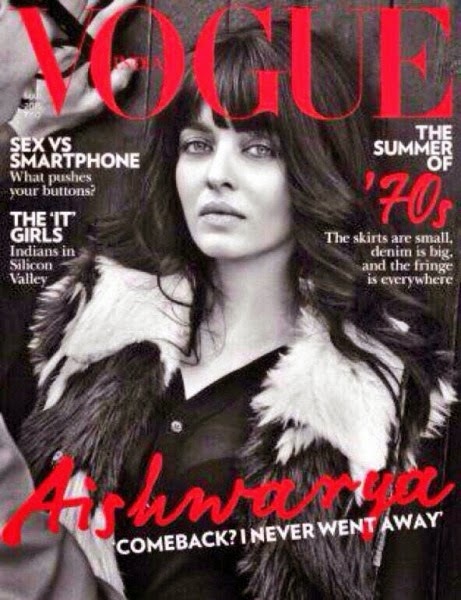 Aishwarya Rai Bachchan adorns the cover of Vogue and the jet black tresses with those retro bangs... Total, total hero here! Definitely bangs can never go out of fashion, the only thing that manages to change is the way you wear them. And Ash nails this look! Alia Bhatt on the other hand graces the cover of Hello! and the Summer element screams out loud! The distressed hairdo with a tone of brown is just so chic and stylish. Perfect, whether it's for a formal or casual do. We love how Alia and Ash's contrasting covers here are just so different yet apt for the season and their respective magazines. What about you?